Bengali Mal Market, widely known as the Bengali Market, is amongst the oldest and most popular markets in Dilli. It’s like a cultural hub, located around the Tansen Marg, with its proximity to Connaught Place and houses around its area the Triveni Kala Sangam, an important arts and cultural complex plus education centre. It somewhat is a small market, compared to other famous markets in the capital, with an array of various types of stores and shops set in a circular fashion around a traffic roundabout. In today’s day, it has grown famous for its North Indian street food shops, specifically the famous Bengali Sweet House. Bengali Sweet House has existed in the place since 1937 and that is surely a long, long time. Having served both pre and post-Partition India, they’re known to many senior Delhi dwellers and now to the younger generations as well. And everyone seems to be a fan of the place, as it’s the go-to destination for some comfort food and the safest bet for classic Indian snacks. It’s popular even amongst tourists, and you’re bound to find foreign tourists perched inside the restaurant, indulging in Indian delicacies. The ambience of the place is like any other simple family restaurant, nothing too out there, just simple but very spacious. The environment is hospitable and the staff very friendly. They’ll seat you with the warmest smile, and hand you the menu. They’ll even be right up with your order as soon as possible! Mind you, they are seriously quick. They have an elaborate menu, harbouring food choices of all types - North Indian, Chinese, South Indian, chaat, pizzas, and many more, all at reasonable prices. It was a tough task to decide, so we asked them and went with the all-time popular ones. Here’s our verdict! 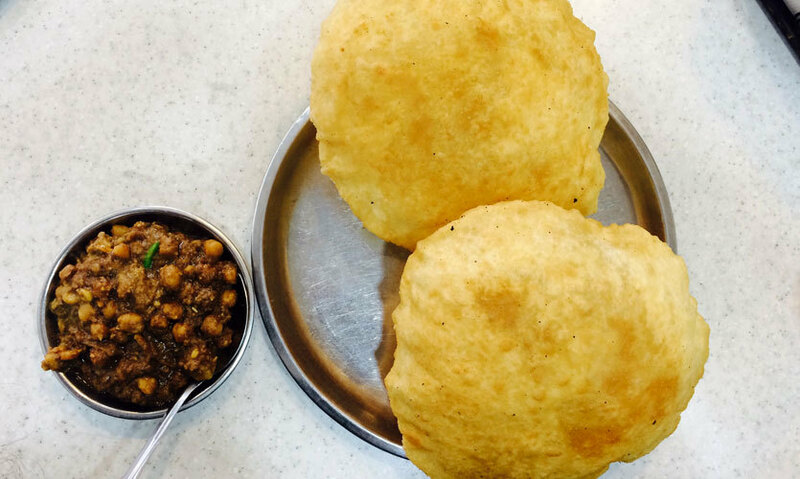 Super popular amongst its regulars, Raj Kachori is priced at Rs 75 and is worth every penny. It looks colourful, vibrant and full of life and flavours. Crispy from the outside, stuffed with soft pakodis, generously laden with fresh curd, and sprinkled with aloo bhujia, namkeen and sweet tamarind chutney. The curd is not too sweet and works well with the sweet chutney. The portion is satisfying and enough for a single person. 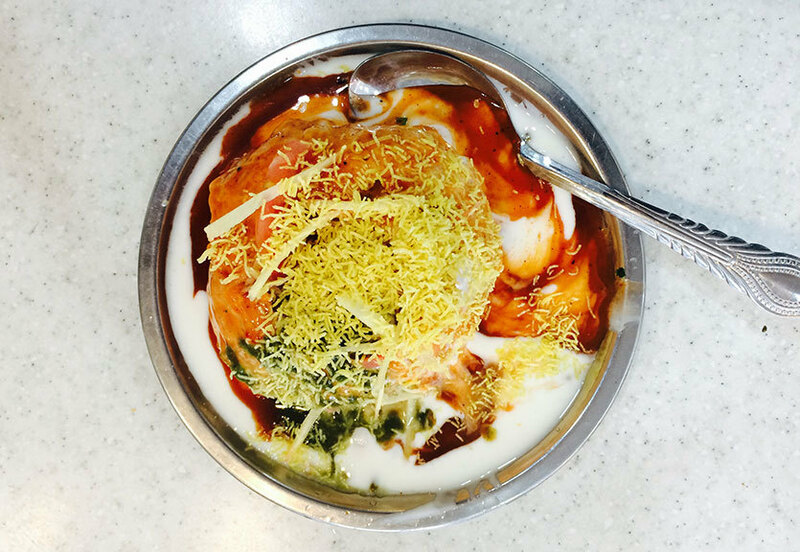 A must try if you’re craving some chaat! Another star of the restaurant is their Chole Bhature. Who isn’t a fan of this popular and delectable Punjabi dish? We sure are! Brought to us in no time, the chana masala was delicious, with the right balance of spices and just a hint of ginger. They served two puffed-up bhaturas, which were also very soft and filling, along with a savoury mixed pickle. One needs to wolf down the dish while it’s still warm, otherwise the chana masala loses its piquancy. This comfort food dish costed us Rs 95, and brought a smile to our faces. They even have other options under their North Indian section, like Dal Makhani, Rajma Chawal, varieties of parathas and lots more. After a trip to North India, we needed to head South! 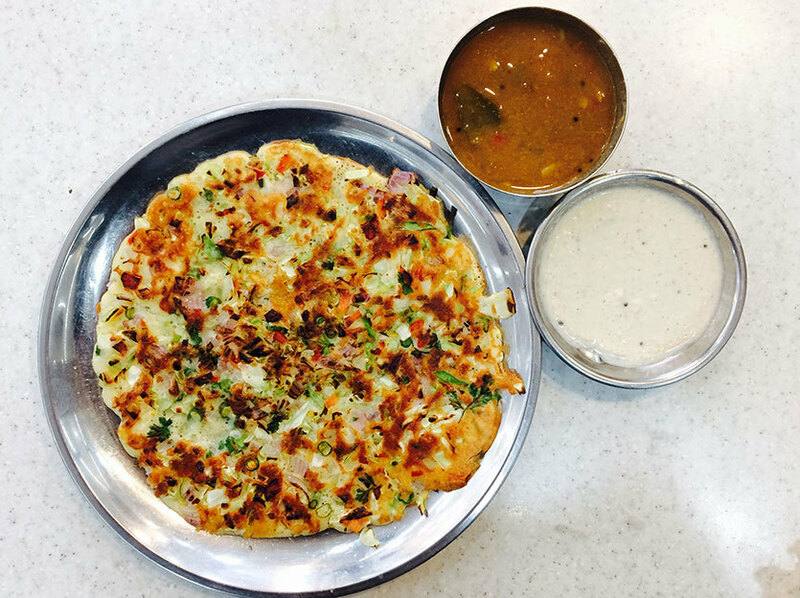 So we decided to order up Mixed Veg Uthappam, known to be a hit amongst the customers especially during the morning breakfast hours. The Uthappam was studded with an array of colourful vegetables and certainly looked appetizing. It was served with a bowl of sambhar and coconut chutney. The sambhar was flavourful, with the perfect marriage of salty and sour. The coconut chutney was fresh and we loved every bite of this South Indian delicacy! It costed us Rs 105 and we thought it was well worth it. 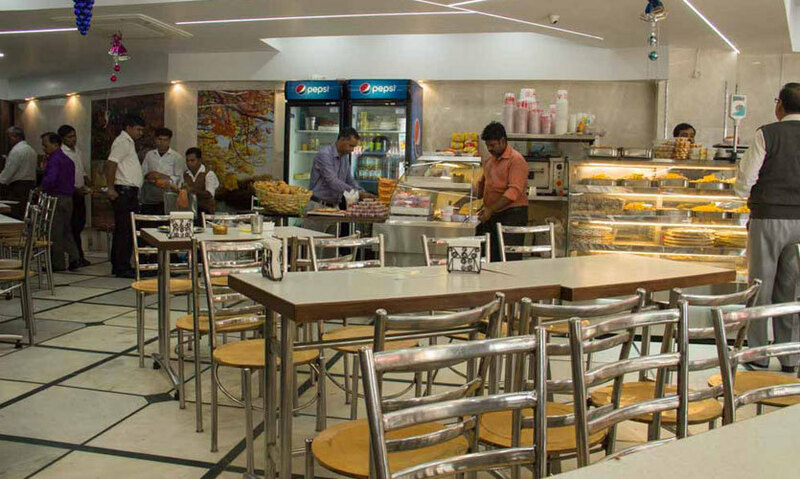 If you visit the place during breakfast hours, you can choose from a variety of South Indian food choices such as their Masala Dosa, Rava Onion Dosa Masala, Vada or Idli Sambhar and many, many more. It was time for us to wander off into the world of sweetness, and so we did! Recommended highly by the serving staff, Gulaab Jamun with Rabri was next on our Bengali Sweet House journey. We were served two oval Gulaab Jamuns with a generous amount of Rabri poured over, them making us eager to dig in. And once we had, it was pure bliss on our tongues! The best part of it was that we felt it was homemade, especially the Rabri; fresh and not too sweet that went well with the luscious taste of the jamuns. We too recommend this sweet escapade that costed us Rs 70, which was worth it. Don’t judge it by its smaller serving dish, because it was certainly satisfying! 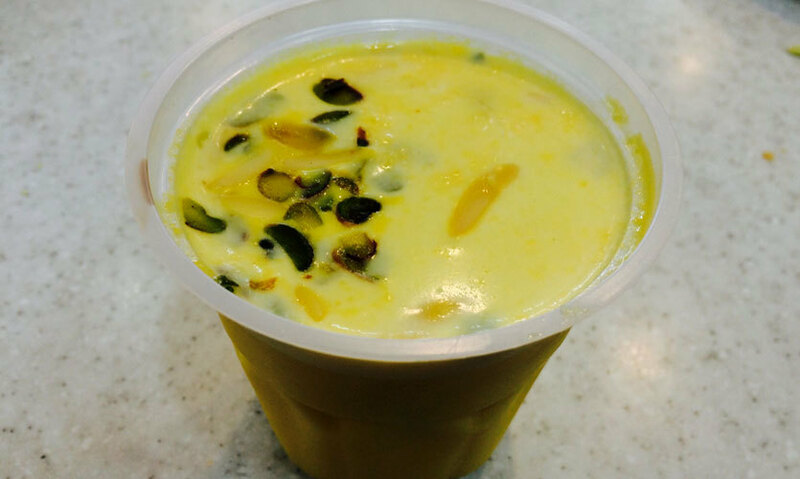 Lastly, we ended our delicious journey with a saffron, almond, and pistachio milk based refreshment drink. It was a good-looking drink, with its yellow saffron tint, and bits of pistachios and almonds sprinkled over the surface. It was a light drink, nothing too heavy despite being milk-based, which made it such a good refresher even during the winter season. This drink costed us Rs 60, which we thought was overpriced, considering the portion of the beverage. There are also other beverage options to choose from, ranging from soft drinks, to coffee and teas, to chhach, lassi, etc. So, if you’re ever in Bengali Market, make sure you step foot in the Bengali Sweet House. The answer to every local’s comfort food cravings, the place serves not only the best sweets and street food around, but is also a full-fledged multicuisine eatery and fast food joint!